Gord and I went to Monster Jam this afternoon at the Rogers Centre. We went last year (my first time ever) and had a lot of fun and looked forward to going again this year. There was a huge crowd with lots of kids. There were two competitions ... racing and freestyle. In the racing competition, the official let them know when it was time to go. A couple trucks broke down during the competition and had to be towed off. The competition was tough and Monster Energy won. Then came the freestyle competition. Drivers had two minutes to wow the five judges and the crowd. Grave Digger did the only back flip ... very cool! The Grave Digger won with a perfect score of 40, with El Toro Loco not far behind. What a fun afternoon! Lots of noise and dust! I can't wait 'til next year! Looks like you had yourselves a very busy weekend. It was a busy but fun weekend! 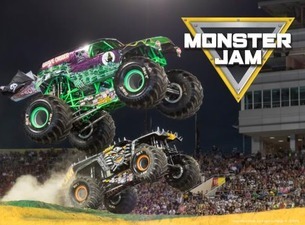 We started with yoga on Sunday morning and finished with Monster Jam ... quite a day!